James bumped right into Patsy’s head, who had been helping him with decorations, when the phone rang. He dropped the Happy New Year banner, so that it swung precariously from one taped edge. “Patsy, it’s the phone.” He tripped over a blue balloon, caught his hand on the corner of his desk, and landed in the chair, which sent him spinning into the corner. The phone rang again. “James, the phone!” Patsy rubbed her head where it had collided with James, and paced back and forth, her poodle skirt making quiet swishing noises with every move. Patsy refused to update her wardrobe to the 21st century. James pulled his chair back toward his desk. The phone rang a third time. He sharpened his pencil and pulled a book open to a fresh, clean page, flattening it with his hand. The phone rang a fourth time. He wrote the date. James punched the blinking line, the only blinking line on the phone, and picked up the receiver. “You Matter Crisis Hotline. 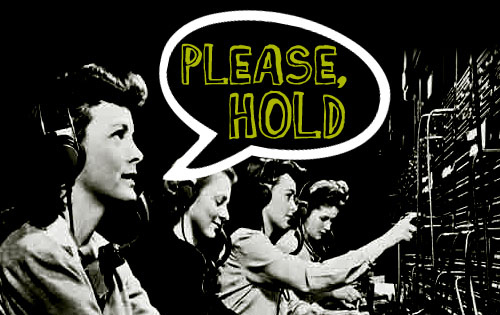 Can you hold please?” Before waiting for an answer, he put the caller on hold. James returned to the book. He wrote the day next to the date, looked at his watch and noted the time, and also wrote that down. Then he returned to his call. “I’m an insomniac.” Fred’s monotone voice did not deter James from his mission. “What does that even mean?” came the reply over the phone, which now sounded a bit more annoyed than depressed. “She took all my Bruce Springsteen records.” Fred sobbed. “If I was so great she would have stuck with me. And I don’t want a fish, I want a girlfriend. Do you actually get crisis training?” Fred shouted. “I had the best dog in the world. Snickers. A yellow lab. He used to be able to get bottles of soda for me from the fridge. Do you know how amazing that is?” Fred’s sobs were bordering on hysteria. My blog is participating in the Forward Motion Flash Friday Blog Group, a weekly flash fiction exercise (that I may or may not manage weekly!). Check out the other participating blogs for more flash. It’s A Dog’s Life–Copy It! 2. Rest! When dogs need to sleep, or when they are bored, they conserve their energy for when something exciting comes along. As humans being and doing, I myself will testify to the fact that I don’t get nearly enough rest. I get maybe 4-5 hours of sleep a night and I rarely nap during the day. I’m going to work on making it a dog’s life in 2013. 3. Eat! When they’re hungry, dogs eat. When you tell them it’s “all gone,” they’re pretty much satisfied and can deal. It’s a good policy to adopt. 4. Drink! Lucy is constantly drinking and I think she has a bladder the size of a pea. Literally. Hence the 4-5 hours of sleep a night, because of early rising. I try to drink 8-10 glasses of water a day, but when my nephew stayed with me for a few days, and then a few days more, it kicked back in a Pepsi addiction, so I’m back to that. 😦 Water flushes toxins out of our bodies, it’s good for our skin, it aids the digestive process, eases back fatigue, there are so many reasons to drink water. 5. Stretch! Ever notice, you who own dogs, that they stretch before they do anything? There you are in a hurry to take them out to do their thing, and they just have to stretch before they can make it up the stairs. Lucy is 3 1/2 years old, and you’d think she was geriatric the way she gets ready to head out somewhere. But stretching is important. It keeps us limber, and it relaxes otherwise tense muscles. 6. Yawn! If I counted the number of times Lucy yawned in a day, I’d have no time for anything else. Now, dogs have all kinds of reasons they yawn. Did you know sometimes it’s a sign of stress? But sometimes it’s just plain ol’ fatigue, and sometimes it’s lack of oxygen, just like with us. So yawn, exercise those jaw muscles.